I was serious when I said I was trying to fill in my three twins knowledge. There are currently 23 flavors and I've only had... six of them? Wow, that's just sad, I didn't realize I was that far behind! I need to get caught up post haste! 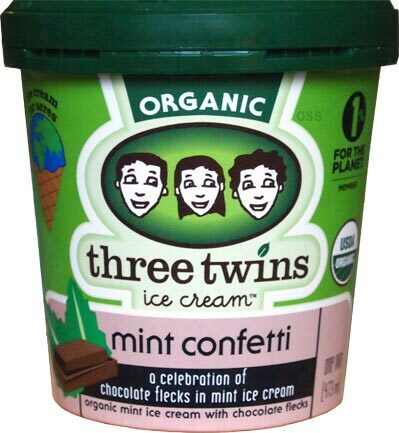 "a celebration of chocolate flecks in mint ice cream"
Uggg, is this one going to be freezer burned AGAIN? I take a quick bite and it tastes just like a candy cane. Lots of flavor with a good peppermint cream vibe to it. Freezer burned texture is a bit rough at the top but I think that I'll be ok. It almost looks green but I think that's just my imagination. 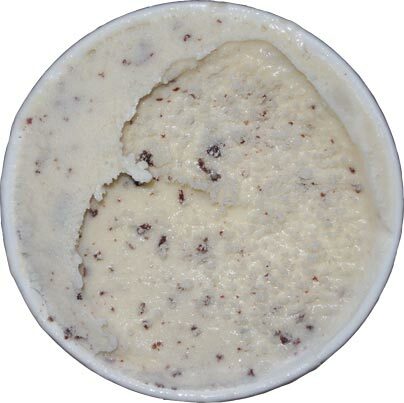 The chocolate flecks are a neat way to go in a bright flavor like this. Rather than jarring you out of the peppermint moment with some large chocolate thuds, they try to compliment the base instead. If you've ever had Talenti peppermint bark gelato, this is a very close analog to that. Ugg, I think the freezer burn is messing with me as there is an odd watery vibe that is building up as I go... or is it? It could also just be the ingredients they chose. I just don't know if there is some kind of all natural funk that is building up here. Ok, I'm going to stop for now. My gut is telling me the peppermint is having a cumulative effect but I won't know until I take a break (no matter how hungry I might be). Until tomorrow! On Second Scoop: Perspective is a beautiful thing. We always want to rank things and click on the "17 best blah blah blahs", but everything is so very relative. For example, I want to say that there is still something off with this flavor but keep in mind that I am devouring the pint as I make that statement. This is still three twins and I'm still inhaling it, but I'm not sure if it's the freezer burn or the mint or something else that is throwing this off for me. Hopefully a few of you can chime in with your own experiences with this flavor and maybe help me figure out what's going on here. @Liz: I know you said all aspects, but what do you mean exactly: flavor, mixins, texture, density? Sorry! I should've elaborated. Flavor was very muted and even a little 'off' (especially in the Cherry Chocolate Chunk and Banana Nut Confetti ice creams); the texture was icy; the mix-ins (especially chocolate chips) were hard and too bitter; and the nuts (walnuts in the banana one) had a rancid vibe. No, nothing was wrong with the expiration dates; and no, there was no freezer burn. They didn't taste high quality or seem high quality at all; yet the Chocolate Peanut Butter Cup flavor was phenomenal (rich, creamy base; melt-in-your-mouth smooth mini peanut butter cups; perfect balance of sweet & slightly savory from the peanut butter). Go figure. I had major freezer burn issues on the pints that I bought. It's like it was missing the fat in the ice cream. I emailed the company but never heard back. @liz: thanks for all of your thoughts! @liz & ryan: the iciness seems to be a repeating theme here. I still want to blame the lack of gums and stabilizers but the thing is that all natural turkey hill never has these issues. is there a hiccup in their distribution chain maybe? taking a 50/50 gamble on getting a non-icy pint is not a good strategy for winning people over. I haven't had any problems with iciness and I have purchased it multiple times. I love the mint ... You must have had a bad pint. 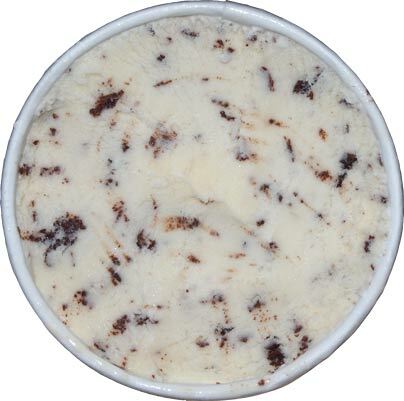 It's smooth and creamy and the chocolate flecks are so much better than chips. My other favorites are the lemon cookie and the chocolate orange confetti. I wish their other flavors were more accessible to me. I'm dying to try Dad's Cardamom, Butterscotch Pecan. and Land of Milk and Honey. As to stabilizers and iciness, I think really what it comes down to is if you go cheap with the base, you have to use stabilizers. Haagen Dazs and Straus are two of the big ones I know with only 5 ingredients: cream, milk, eggs, sugar, and flavor. They also have fat contents dramatically higher than Three Twins. 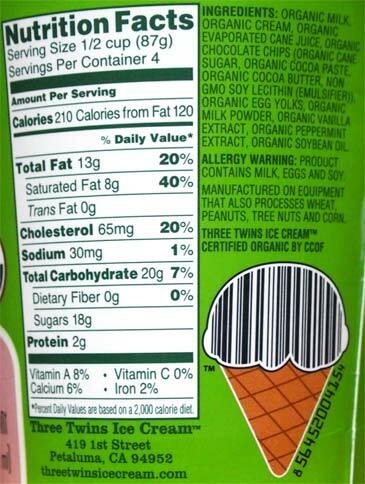 To give you an idea Three Twins has 11 grams of fat per serving for their base chocolate flavor vs 17 grams in Haagen Dazs and 15 in Straus. That is a dramatic difference really. In the order of 50%. Its just less cream, really as simple as that. And that is because cream is expensive. 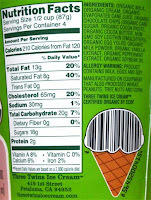 Now the less fat you put in, the more you likely need soy lecithin, carrageenan, guar gum, etc. And doubly so if you use no egg yolks. Terrible. Very icy. I'll stick with better brands.